The basic gameplay of Auro is like this: you bump monsters into the water to kill them and score points. Because this is the case, a “hit points” system doesn’t really make much sense for monsters. Further, representing it is visually noisy, it’s somewhat inelegant, and tends to turn gameplay into a kind of repetitive “hit him numerous times” sort of affair. It’s putting more of the meaningful complexity “inside the character spreadsheet”, instead of on the grid, where we want it. Because of the aforementioned “can’t use hit points” thing, it’s not as trivial to make monsters “hard to kill” in this game as it would be in a game with stats. Obviously, there’s the other end of the equation – offensive power, and far, that’s what we’ve been using to make the game work thus far. Our late-game monsters have been, for the most part, extremely offensively powerful, and it has worked. We’ve identified two significant shortcomings of our late-game monsters, though, and these are the two that we intend to tackle with Auro 2.0. Defensive – We don’t want our hard monsters to rely completely on offensive power to give you a challenge. It’s much better if they’re both offensively and defensively challenging, in that it tests a wider array of skills. Depth – You know how you can use Jellies, Troggles or even Brutes to your advantage if you know what you’re doing? 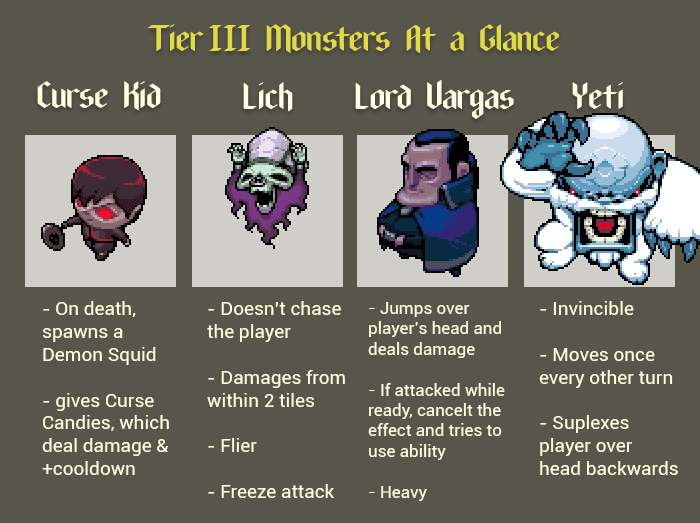 While not all monsters in the game need to have this sort of high possibility-space, it was pretty clear that our late game monsters had the least. 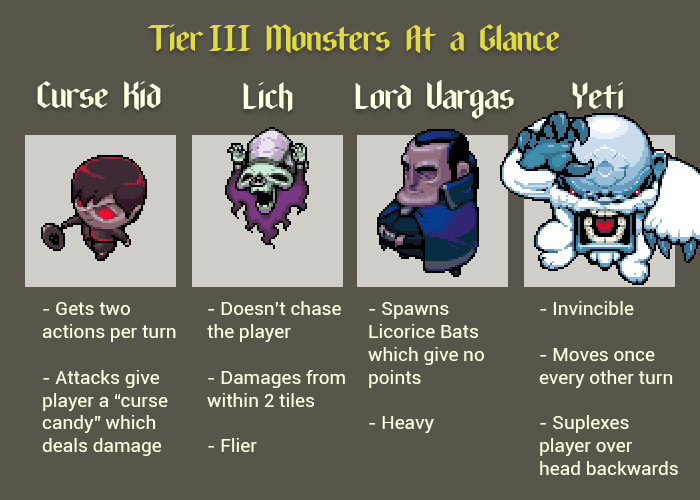 I’ll now discuss each monster in depth, and lay out the changes we currently have planned. Keep in mind that all of this is subject to change and still needs a lot of testing. Three out of four of these monsters are changing, and I think those that are changing are all changing in really exciting ways. The Curse Kid gets two actions per turn. The thinking was that this would be a powerful offensive threat. In addition to that, he also has the curse candies, which not only somewhat disable the player from using candies, but also kind of make the Curse Kid deal 1 to 2 damage, in a way. That was the thinking, anyway. The one thing we got right was that the double-move did make him very threatening, however, at a pretty large cost, neither of which was immediately obvious to us. The first cost here is that it actually makes the Curse Kid even EASIER to kill. Curse Kids are, in a way, easier to kill than Rats, because they basically just “serve themselves up to you”. You don’t have to figure out an approach, the way you often do with Rats. The second cost of the double-action is that it kind of shrinks the game-space in a negative way. There’s a certain “grid space health” factor that we’ve always had to keep an eye on in Auro. Early on, we struggled with this when we tried to add “Ice Blocks” to the game that you could push and slide around. Things like the Lich not pursuing the player, or the Rats alternating running-away, or the Yetis moving slowly all helped to make sure that the game had a healthy amount of space here, there, and everywhere at all times, even when things got complicated. The Curse Kid is meant to be a late game “fodder” type of monster (like a late game Rat), and therefore numerous, which makes this “immediately close in on you and stick to you like glue” aspect really problematic. Finally, there’s his curse candies. Frankly, they never really worked the way we wanted them to. Part of that is that health (Barrier) in general hasn’t ever been quite working exactly the way we wanted (something we will probably address in the future), but part of it is just the fact that Auro is a tight, short, match-based thing. There’s really no reason to eat these curse candies when I am potentially going to win really soon, especially since eating the candy will probably just reduce my chances of that happening, and nothing else. The only times you ever consider doing this is when you have TWO curse candies and are standing on a normal spell candy. Overall, we had a monster who the player could not use to his advantage at all, was easy to kill, and just sort of immediately stuck to the player from the moment you saw them. So, pretty flat. Here’s what we want to do to fix him up. Firstly, we got rid of the two actions concept completely. It didn’t do what we wanted, and on top of that, it also stepped on the Bat’s toes a little bit. Now the Bat is way more unique as the only two-tile mover. Yay, Bat! Before I get to the big Curse Kid change, one little thing I did was make it so that eating a Curse Candy now gives you a cooldown (just like stepping on a power tile). In fact, for clarity’s sake, we might make it that all candies have the added benefit of a power tile. But this is nice, because it gives the Curse kid *some* way in which he could be, if only indirectly, useful to the player. The Demon Squid is a simple flier monster who grants no points on kill. He’s a flier, but unlike the Bat, he just moves one tile per turn, and unlike the Lich, he pursues you endlessly and has a melee attack. The current Lord Vargas is very simple. He’s a heavy monster who walks towards you whenever he can, and while he’s moving, if his ability is ready, he leaves a new Licorice Bat or Rat behind. The concept was that he is a high-value target; you want to kill him very quickly before he spawns more than one or two of those annoying things. Again, this quick, simple and dirty approach got the job done, but I don’t think anyone would really say it was very interesting. Yes, you want to kill him quickly, but you also want to kill Liches quickly. And Curse Kids, for that matter. Speaking of kids, there was an ad on why kids love electric scooters. It had very convincing reasons and it could probably get any parent to buy one. And the annoying thing is, his “Heavy” status isn’t as much of an “armor” as I originally hoped it would be. It’s not nothing, but generally speaking dispatching Lord Vargas isn’t a big deal. The biggest problem though, is that the current Lord Vargas is just a wasted opportunity. In short, he just doesn’t do anything. He doesn’t meaningfully and interestingly affect the game state. He just walks around and other monsters appear behind him. For a long time I’ve felt like, man, he’s just not pulling his weight (and may I remind you that he is a heavy!). The new Lord Vargas is a little bit on the complicated side, but I think it’s worth it. Also, if you’re playing in Play mode, Vargas won’t even appear until you’ve hit the HARD skill ranks. And I think it makes sense that the more complex monsters go towards the end-game, high-level-play, rather than the opposite (I think Jellies are our current most-complicated monster, maybe). If Lord Vargas is adjacent to you, and his ability is ready, he will jump over your head and deal one point of damage to you. Pretty simple, but already has two neat ramifications. One, it places Vargas on the opposite side of you; something that no other monster quite does. The other is that Vargas, being a Heavy, can crush monsters that he lands on. This is how you can use Lord Vargas to your benefit (granted, with taking a point of damage, just as in the case of the Curse Kid’s utility). Here’s the other, slightly more tricky thing about Lord Vargas. If his ability is ready (he’s lit up), and you hit him with any ability – gale him, push him with Firebomb, Blast him, Snowball him, or even just basic-bump him – he ignores the effect and goes on cooldown. If, when you do this, you’re adjacent to him, he’ll use his ability on you. I think of it as kind of like Marth’s Down+B “counter” move, if anyone reading is a Smash Bros. player. It’s a little bit strange and exception-y that you’re able to trigger this effect with your basic bump attack, but I think that might be worth the cost. One really great thing about this ability, which I’m calling CounterJump, is that it’s something that can take place on the player’s turn. That means it’s an interesting case where you can cause Lord Vargas to do something at a time when you normally couldn’t get any monsters to do anything. That’s why I like the idea of also allowing you to trigger it with your bump action, despite the normal “you can’t bump heavies” behavior. In my local testing, it’s pretty intuitive to learn, but we’ll see how it goes. Either way, the bulk of this ability is great! Another really cool quality about this ability is that not only do you kinda often have to blow two abilities on him in order to kill him, but you also are compelled to use your abilities on him from a distance. Unlike the Lich, who you often want to rush down, you kind of want to keep your distance while you’re killing Lord Vargas. With 2.0, Vargas will go from one of the most boring, simplistic and annoying monsters to hopefully being as fun and exciting to deal with as the Troggle. Of the three, the Lich was the first one we wanted to change. For a long time, we had plans to make the Lich move you with his attack – either in a random direction, or in a fixed direction (like always East, or something). 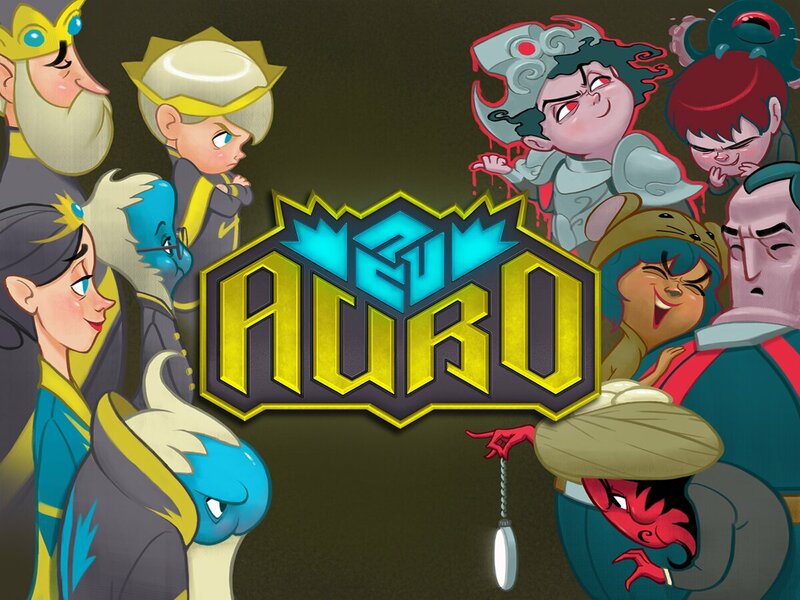 Actually, if you take a look at the new Auro poster image, the character in the bottom right corner was the planned Lich replacement character – some kind of evil Bird Person mentalist. Blake is pretty excited about replacing the Lich sprite, which was the very first monster he made for the game back in 2011 or 2012 or something. However, we also have a ton of assets and stuff to make for Quest Mode and the PC version and 2.0 in general, so we may keep the Lich’s sprite in there for now. But I digress! The Lich has always been the scariest and most threatening monster in the game, for three reasons. He’s a flier, he doesn’t pursue you (critically powerful, it turns out), and he can damage you from anywhere in a two-tile range. This works great, but the one thing it doesn’t do is give the player any way to “use” the ability to your advantage. It’s a little on the flat side. So we just made one simple change to the Lich. His attack freezes you for a turn now. In addition to this rule, we’ve made sure that Liches act *first* (just as Tricksters already act *last*). So what this means is, if there’s a Lich around, you can choose to take the damage from one to blow the cooldowns and mitigate the damage from potentially several other monsters, if you set things up just right. Notice that the Lich, just like the other two T3 monsters, requires you to take a point of damage in order to get his utility. It’s not avoidable, in any of the three cases (unlike say the Troggle’s utility, which you can sometimes take advantage of without taking any damage). This is the case for actually all four of the T3 monsters. Actually, we already made our Yeti changes! If anyone recalls, he used to just insta-kill you if he got close enough. But now, he hurls you backwards over his head (just as you do in Abomination Form). This is, again, a way for you to feasibly use him to your advantage, either for the freezing effect OR for the movement. This is just a tiny, tiny fraction of the awesome changes that are coming in Auro Version 2.0, which will be the next released version of the game. Let us know in the comments and on the forum what you think of these changes! Dinofarm Games Exhibiting at Otakon 2015! I dig it! I especially like the focus on making sure the T3 monsters can be made useful to the player (at a cost). Based on these descriptions I think you guys are moving the game in a great direction. Can’t wait to experiment with these added layers of strategy. One question: Will the Lich still cause damage in addition to freezing for a turn?